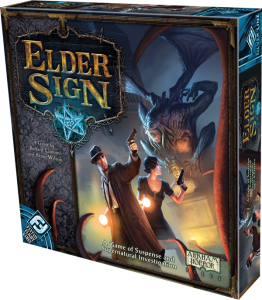 This board game has received awards for its use of theme and supernatural atmosphere. Players will spend most of their turns rolling a set of unique dice. However, there is a good deal of strategy involved in how you work together with your fellow players to handle all evil thrown at your team. Simply rolling dice and placing them on the board without thinking ahead several turns will cause your team of investigators to lose to the Ancient One. The mechanics are fairly simple and easy to learn, especially if you have played other dice games like Roll for the Galaxy, Euphoria or Star Trek: Five Year Mission. If you are totally new to the concept of dice-rolling strategy, there is a small learning curve but nothing too extreme.